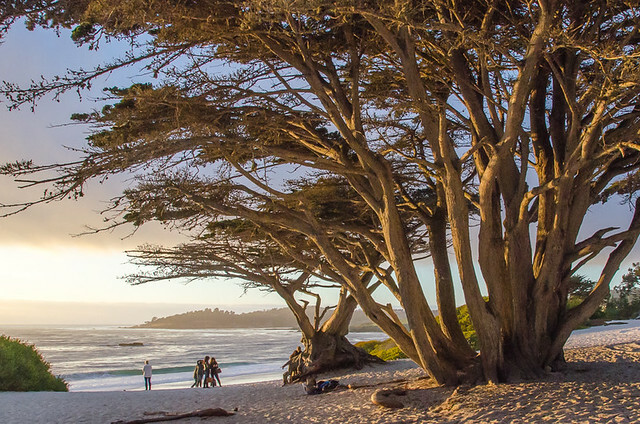 For too long, I’ve been remiss in not sharing one of our favorite places in California: Carmel-by-the-Sea. 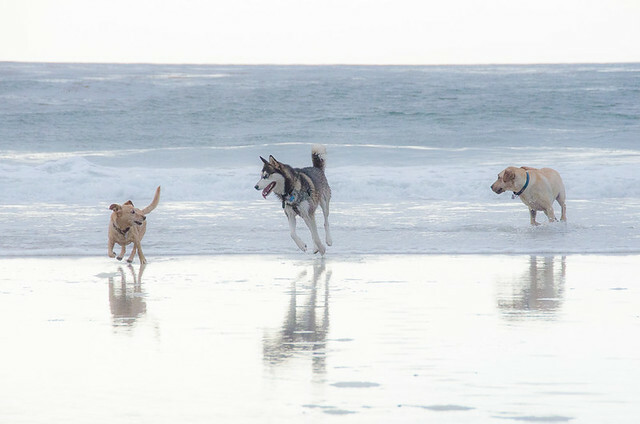 While those of us on two legs will appreciate the quaint village near Monterey, you won’t want to leave your four-legged friends at home. 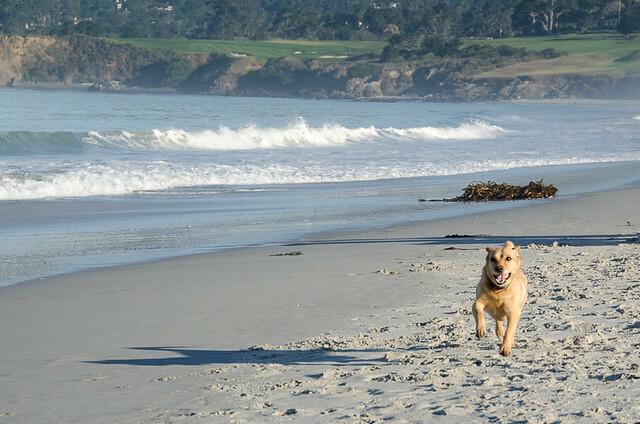 Carmel offers, hands down, the best dog friendly beaches in California! 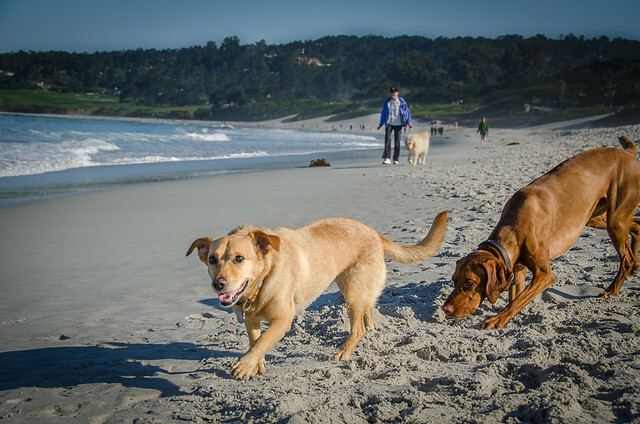 While most California beaches allow you to walk on the sand with a dog on leash, Carmel is unique in that they let dogs run entire length of the downtown beach off leash. The scenic, white sand beach at the foot of Ocean Avenue is busy from morning to night with people walking along the water and playful dogs splashing in the surf. We love to take our dog, Posey, there and visit every chance we get. 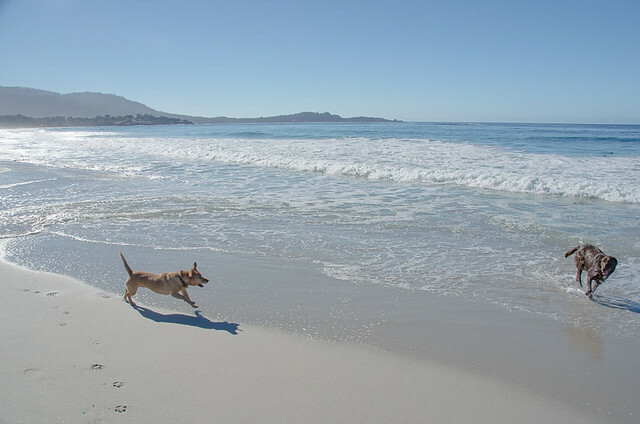 Carmel Beach is a safe place to let dogs run, because it’s a wide beach bordered by steep sand dunes. Dogs do have to be under voice control and play well with other dogs and people, because this place gets busy. Misty mornings often have ambient clouds shadowing the mountains looking toward Big Sur. 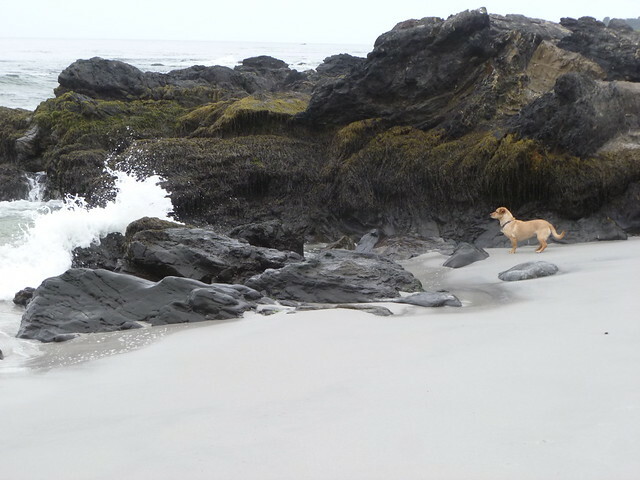 The south side of the beach is rich with a washed up kelp forest that dogs love to sniff and explore. The north side of the beach offers coastal cliffs, mossy, black-rock tide pools, and some of the whitest sand I’ve ever seen. 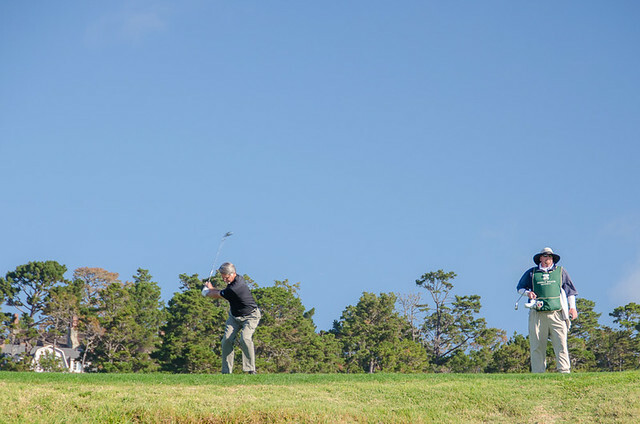 The north side of the beach also sits at the base of the 9th hole of the famous and exclusive, Pebble Beach Golf Links. When you pass by, look up as you might catch a glimpse of a PGA pro about to drive. 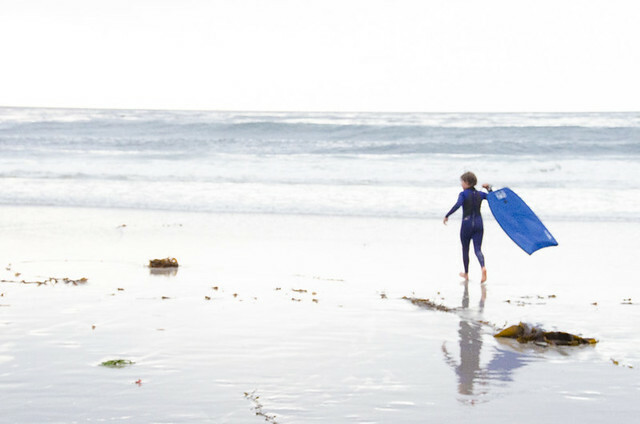 While the place can be chilly in the winter, that doesn’t stop visitors and local kids from rolling up their pants and jumping in year-round. Surfers and body boarders often catch decent waves here. 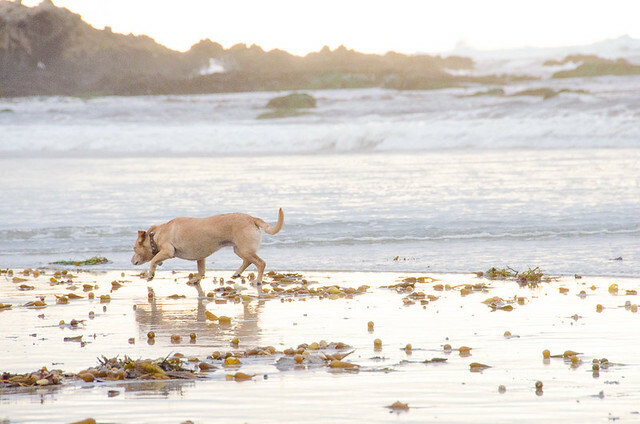 So if you’re looking for a beautiful beach on the Monterey Bay with or without your four-legged friend, this scenic spot will fit the bill. 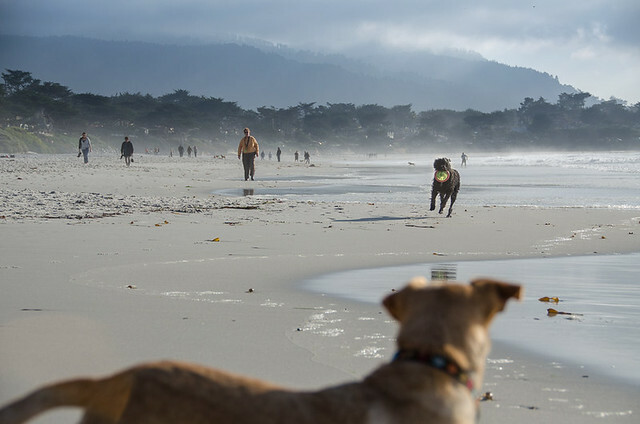 Check back for our next post where we’ll share some things to do with your dog and dog-friendly hotels in Carmel. So awesome! I really wanted to take Poppy here for her birthday in November, but I didn’t get my act together. Maybe next year, if not sooner! Looks like so much fun and Poppy LOOOOVES! the beach! This is great, EIT, but what about a beach for your cat? Would EIT perhaps post this year’s picture of Sylvie on Santa’s lap in the next edition of Photo Friday? That beach is a wonderful place for everyone. When I’m there, I don’t want to leave. Yes, I remember you sharing photos from there once. If I recall, you have a really gorgeous photo of the beach cypress! It’s a great food and wine town, too, Jenna. I’ll be writing about that soon and will make sure you see it before your next trip! Love Carmel, and your shots are amazing. 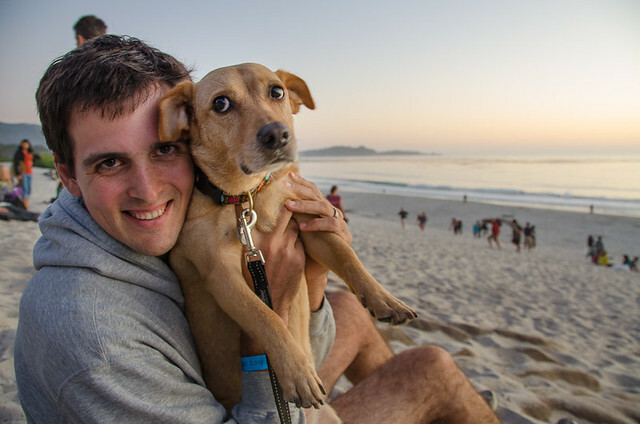 It makes me want to go to the shelter, get the first dog I see, adopt it, and hit the beach. Fun! Hi, Just a question about one of your pictures. The one with the Large Cypress Trees in the sand, how exactly would I get there? Is it the cluster of trees at the end of Ocean AVE? Thanks for reading! That large Cypress is really easy to find. You just drive down to the parking lot at the end of Ocean Ave, walk by the bathroom onto the sand, and the tree is right there! The view is spectacular, but the best light is at sunset, which makes it all look like a painting. Have a great family trip! Thanks for the post Cassie/Kevin! 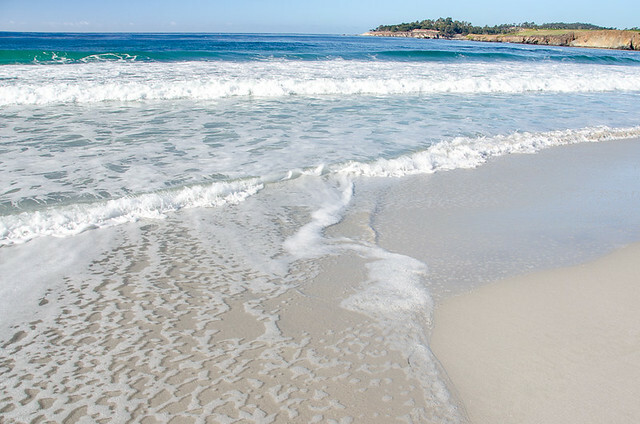 One question – I haven’t been down to Carmel beach, but I was thinking of heading down there on thanksgiving weekend (next week!) and watching the sunset with my girlfriend, setting up a bonfire, and proposing to her (!!!). 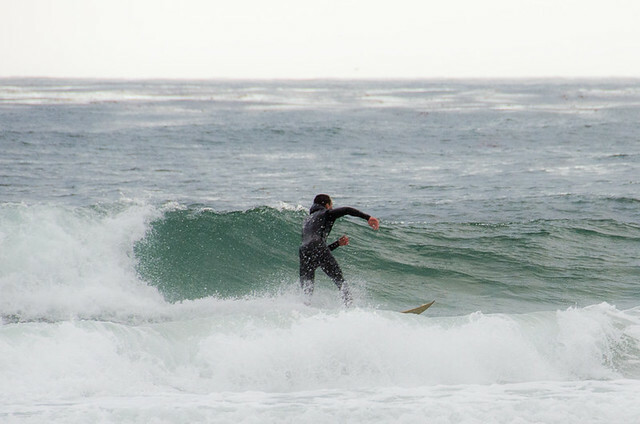 I would also like it to be a discreet/private – do you think it would be a little too crowded over this weekend, or is Carmel beach not too busy in late November/thanksgiving weekend? Hi Nish! What a wonderful plan! I’m sure she will love it! You know, my husband and I got a gift certificate to stay down there for our own wedding, and had a romantic weekend getaway (with our pup, of course). It will be crowded, it is busy there all year round, but past dark–if you do a bonfire–there will be fewer people. People flood the beach for sunset, but not everyone sticks around for fires after dark, especially in the winter.